After a two-month absence during the winter of 1896-97, the mysterious object—described by some witnesses as being suspended beneath a dark, cigar-shaped craft—reappeared over the Midwest, where it was reportedly seen from Nebraska to Michigan and from Minnesota to Texas before abruptly disappearing for good in April of 1897. Though generally dismissed by modern skeptics as an example of media-driven mass hysteria (perhaps helped along by sightings of the planet Venus), the sheer number of reports—several thousand by some estimates—makes it unlikely it was nothing more than the press having a good laugh. Some have even suggested the intriguing possibility it may have been an early airship making its appearance years before the Wright Brother’s plane ever flew—making it more terrestrial than extraterrestrial in nature (and evidence of a nascent technology emerging years before it was supposed to). 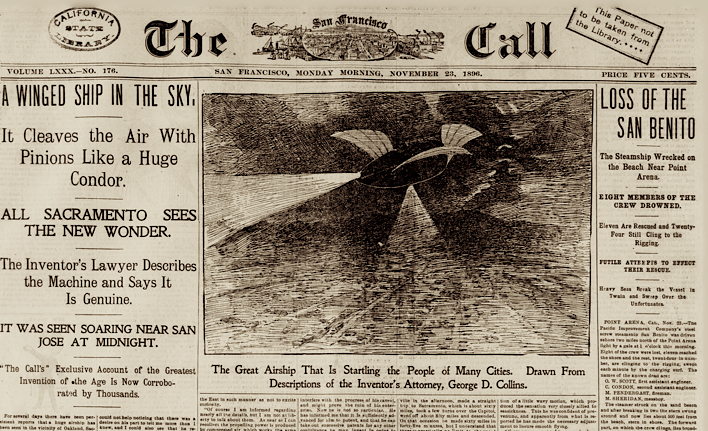 In any case, “the great airship of 1897”—or whatever it was—remains as much a mystery today as it did in our great, great grandparent’s day.